The Syracuse University Art Galleries will host “The Rosenquist Network: Collaboration and Connections in the American Print Workshop,” a symposium exploring the role that the printmaking workshop has played in contemporary American Art, and in particular in the career of artist James Rosenquist. 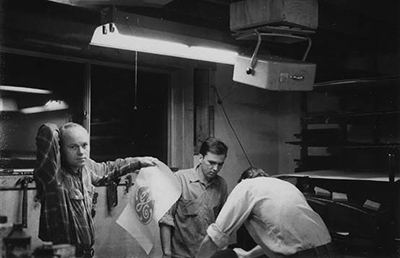 James Rosenquist looking at a proof of the “GE logo” for Circles of Confusion I at Universal Limited Art Editions in 1965. Photo courtesy of ULAE. The symposium panel assembles some of the most influential print publishers and scholars working in the graphic arts field, including longtime Rosenquist collaborators Bill Goldston, master printer and director of Universal Limited Art Editions; Donald Saff, founder of GraphicStudio; and Sarah C. Bancroft, co-curator of the artist’s full-career retrospective at the Guggenheim Museum in 2003. Presented in conjunction with the exhibition “James Rosenquist: Illustrious Works on Paper, Illuminating Paintings,” on view at the University Art Galleries through Nov. 22. A special Lunchtime Lecture with Sarah C. Bancroft precedes the symposium at 12:15 p.m. Bancroft, curator of the “Illustrious Works on Paper, Illuminating Paintings” exhibition, will lead visitors on a gallery tour of the exhibition at the SUArt Galleries. This event is free and open to the public. Parking is available on a first come, first served basis, in the Q4 parking lot. Please visit http://parking.syr.edu for further details. The SUArt Galleries will be open for visitors to view the related exhibition until 8 p.m. Complete information and related programming is available by visiting the website at http://suart.syr.edu/. Saff holds degrees from Queens College, Pratt Institute and Columbia University. He is emeritus dean and Distinguished Professor at the University of South Florida and was a curator at the Guggenheim Museum in New York. He has taught and authored books and numerous articles in the field of art history. His own work has been documented in a recently published book titled “Donald Saff: Art In Collaboration” (2010). Saff’s art is in the permanent collection of many major museums, including the Metropolitan Museum and the Museum of Modern Art in New York and the National Gallery in Washington, D.C.
Goldston is the director and master printer of the print workshop Universal Limited Art Editions. His long list of collaborators includes Jasper Johns, Robert Rauschenberg, Helen Frankenthaler, Jane Hammond and Rosenquist. Bancroft is the associate director at Fluent~Collaborative/testsite, a contemporary art space in Austin, Texas. She was the co-curator of Rosenquist’s 2003 retrospective exhibition at the Guggenheim Museum in New York and is the curator of the current exhibition.